Talk about stranger things: It might seem unusual that Netflix is reportedly willing to pay as much as $300 million for a billboard company. But it might make some sense, too. Reuters last week reported the Netflix bid for Regency Outdoor Advertising, a company that has a lock on billboards on the Sunset Strip and other prime see-and-be-seen locations in Los Angeles. Neither company is commenting. Netflix has been a good Regency customer. Billboards last year that proclaimed “Netflix Is A Joke” in L.A. caused a lot of social media buzz. Then it became clear in a commercial aired on last year’s Emmys telecast that it was Netflix’s way of hyping some new comedy enterprises. In Los Angeles, the ultimate company town, the blanket of Netflix billboards might seem like vanity advertising. But Sesto says, “Out here, billboards are almost like a TV Guide for them.” It’s how Sesto and others in the marketing and entertainment business find out what’s next for the digital content giant, and who’s hot. Netflix is only the most obvious brand that is making the intersection of social and outdoor advertising a trend. The growth of digital, and particularly social media and smartphones, is changing the outdoor business, and Dash Two has placed its emphasis on ads appealing to the youth culture and appearing giant sized. “In the last two or three years, it’s become so much more obvious to us,” Sesto says, and his company evolved from a wider-focused ad agency to one to its current outdoor and digital model. Now, billboards are a thing on social media. Dash Two started as an agency for artists and labels, with clients like Warner Bros. Music, Sub Pop and Live Nation and youth-oriented brands like Uber Eats, Maker Studios and American Apparel. 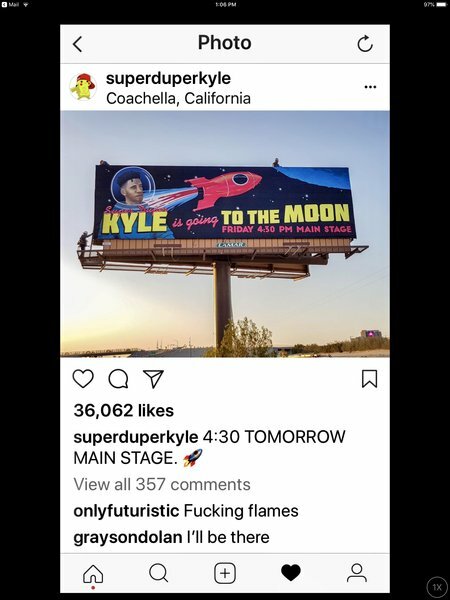 For current example: Dash Two put up 18 billboards on the 130-mile stretch of I-10 Freeway from Los Angeles to the Coachella Music Festival. Concertgoers stopped on the way to shoot videos or take selfies in front of the signs and then post them to their social media accounts. That was the whole idea. “It’s how an intangible thing becomes a tangible thing,” Sesto says — how the blur of a roadside sign somehow turns into a piece of user-generated marketing. When that’s not happening, it’s musicians creating time-lapse videos to chronicle their new billboards. Last week, Dash Two announced a deal to repurpose the material from those Coachella billboards into backpacks, tote bags and laptop covers made by RareForm, a California company that recycles 20,000 pounds of old billboards a month for goodies like that. Sesto says few recording artists spend enough money or erect enough billboards to market themselves in a conventional sense via outdoor advertising. “They’re all doing it as a part of their social strategy,” he says, creating more content for their sites and connecting with their fans. If along the way they get a 12-foot-by-48-foot memento of their careers, that’s just a plus. 1 comment about "The Trusty Old Billboard Becoming A New Social Media Hit". Gino Sesto from DASH TWO, April 16, 2018 at 4:58 p.m. Thanks for the great interview PJ. I'm gonna keep using that line.. Outdoor Advertising is the modern day TV Guide!